That’s my proposed name for this month. I propose that we declare the entire month of October as a Friday. It has certainly felt like a Friday every day since the start of the month. Better hurry, its rotting quickly. Because this generated so much interest and people are really want to know, “how rotten is the banana?”. 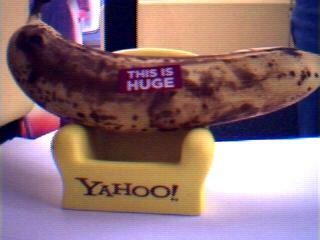 I put up a webcam so everyone can watch this banana rot away. Posted on October 5, 2005 by Jeremy Cole. This entry was posted in Freaks, Yahoo!. Bookmark the permalink. Wait til it looks like a turd – then it’s Nastyassbanana time!